Falcon Way broke his maiden today at the Sunshine Coast Turf Club at his fourth start in a race and only his second start for Team Guy. The son of Statue Of Liberty was sent north by his owner John Moore after two fruitless runs in Sydney. 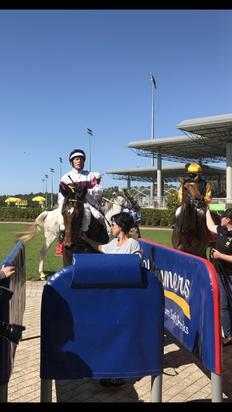 Settling into his new environment Falcon Way was unlucky at his first start in the Sunshine State after drawing a wide barrier at his Queensland debut and should have finished much closer in that race given an ounce of luck. Settling in fourth position in today’s race Falcon Way made his move at the top of the straight before wearing down the race leader to score by a head.